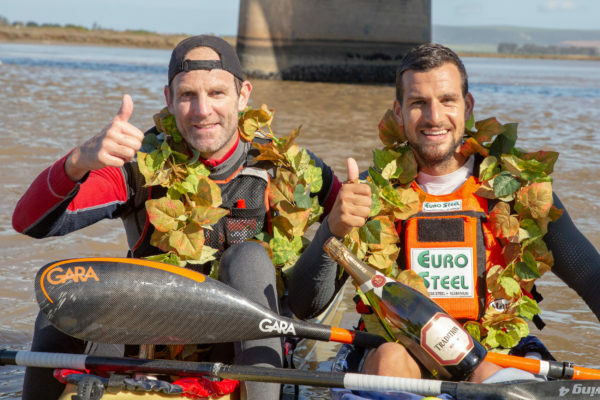 Velddrif – Last year’s champion and runner-up Team Bamboo Warehouse’s Adrian Boros and Graeme Solomon made history when they became the first team to win the Berg River Canoe Marathon in Velddrif on Saturday. It was a day of records for 45 year-old Solomon who ended an incredible 17 year drought to win the race for a second time while also becoming the oldest person to win the event since Nollie Meiring won the four day odyssey at the age of 44. 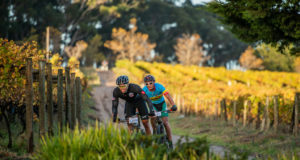 The pair lived up comfortably to their pre-race favourites tag as they spent the first two days establishing a healthy eleven minute lead going into the final stage on Saturday which they won ahead of Joep van Bakel and Keith Moule. 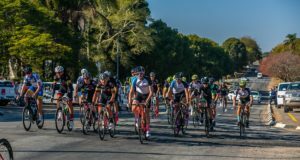 The day’s racing was a formality with just stage honours the only realistic shot at glory for any of the chasing teams, however Solomon and Boros had other plans and powered home to their third stage win out of four. “When I won in 2001 I thought it was going to be the first of many!” Bamboo Warehouse’s Solomon said. “That wasn’t the case and then it was a long time coming second, third, fourth and fifth and sixth; all sorts of positions other than the one that I wanted. The unknown of the team format wasn’t daunting for Solomon who spent four days in 2017 getting to know Boros’ strengths and weaknesses. “We raced last year like a pair but we were fighting against each other back then. “As competitors you learn what your opposition is good at so we went into this year’s race with a good idea of how strong we both were. “It was a good combination because what I lack on top end speed he provides, and what he lacks in river knowledge I provide so it was a great team,” Solomon added. Boros had his first taste of the Berg River Canoe Marathon in 2016 where he had the likes of Hank McGregor and finished third in that showdown and then went two places better in 2016 where he beat Solomon to the title. To back that up with another win in 2018 along with Solomon is an impressive achievement for the Hungarian marathon ace. “It was awesome to defend my title this year and to do it was Graeme was also incredible,” Boros said. “He taught me a lot about the river and led me through a lot of the tricky sections but I made up for it pulling on the flat sections so we made a good team. Moule and Van Bakel spent the majority of the final three days playing catch up and due to some errors the gap grew in size to the leaders which ended the race as a contest, however they hung in well to finish in a solid second place. “We came into the race as probably the second favourites so the race unfolded like we were expecting,” Moule mentioned. “We were definitely hoping to put the front guys under a bit more pressure because the closer you can keep on their tails the more pressure you put on them and hopefully the more mistakes they make. “Unfortunately that plan went out the window on the second day after we made those mistakes towards the end of the stage. We kind of handed the race to them after that. “They had the buffer and just told us that we had to make the pace and we made the best of it on day three which took a bit out of us. “Then again today they held all the cards and are really strong,” he added. The age group titles were never in doubt throughout with Change a Life Capensis’ Mthobisi Cele and Mpilo Zondi taking home the Under 23 crown while the impressive dup of Melvino Klaase and Angelo Smith won the junior title, finishing eleventh overall. The mixed team title fell to Lisa Scott and Kevin Bouwer, as they gratefully stepped into the space left by the demise of the Crispin Thompson\Bianca Beavitt combination when Thompson withdrew on the third stage, leaving Beavitt to soldier on alone as a solo paddler.